This eye-catching remark comes from neuropsychopharmacologist David Nutt, and he is talking about a study on which he was the senior researcher: “Neural correlates of the LSD experience revealed by multimodal neuroimaging”, published in the journal Proceedings of the National Academy of Sciences in April 2016. And like the results of the research on the Higgs boson, the results of Nutt’s study confirmed the theory—in this case, that the observed changes in brain activity would provide a very good picture of the mental state produced by an “acid trip”. The LSD (lysergic acid diethylamide) molecule was first synthesized by Albert Hoffman, in 1938. But for decades, a number of obstacles prevented a study of this kind. Not the least of these was the official outlawing of LSD after it became the premiere recreational psychedelic drug of the 1960s. The drug’s disorienting, paradoxical effects also probably discouraged more than one researcher, while adding to the aura of mystery around the way that it alters brain activity. In the Nutt team’s experiment, 20 subjects came to a clinic and received intravenous injections on two different days. On one day, each injection contained 75 micrograms of LSD; on the other, it contained a placebo (nothing but a physiological liquid). The researchers were thus able to compare the actual effects of LSD with other changes produced by expectations or conditioning, for example, in the same person. Impressively, the experiment used three different but complementary brain-imaging techniques to attempt to capture all of the effects of LSD. Two of these techniques—arterial spin labelling (ASL) and resting state magnetic resonance imaging (MRI)—use indirect readings of neural activity based on blood flow in the capillaries of the brain; the third technique used was magnetoencephalography. 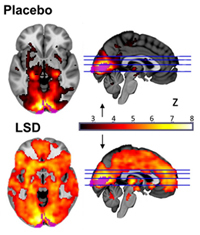 By analyzing the results obtained with this combination of three techniques, Nutt’s team obtained a better understanding of two major types of effects associated with taking LSD: visual hallucinations and a sense of self-dissolution. With regard to visual hallucinations, the three techniques revealed increased blood flow, decreased alpha wave power, and greatly expanded functional connectivity in the visual cortex . The size of these three changes was correlated with the intensity of the visual experiences subjectively reported by the subjects. As the study’s principal author, Robin Carhart-Harris, reports, it was somewhat as if the subjects were seeing, but with their eyes closed. In other words, their visual systems were no longer being stimulated by the outside world, but rather by the intrinsic (endogenous) activity of their brains—their imaginations, so to speak. And in fact, the research team observed that under the influence of LSD, many other areas of the brain (those associated with hearing, attention and movement) interacted not only with the visual areas but also with one another, resulting in the “more unified brain” that this drug has been said to induce. But at the same time, the LSD also produced more fragmentation in other brain networks—yet another proof that a single substance can have different effects in different places in the brain, and especially a substance with such complex effects as LSD. This decreased connectivity was observed mainly in two brain structures: the parahippocampal gyrus and the retrosplenial cortex (part of the posterior cingulate cortex). And the measured intensity of this disconnection was correlated with the subjective impression of self-dissolution and of the altered meaning of things. Here again, the sense of becoming one with others, with nature, and even with the universe, which LSD users have been reporting for decades, finds an interesting neural correlate. Especially since this sense, which is often interpreted in a spiritual or religious way, seems to be associated with improved well-being for some time after the immediate effects of the drug have worn off. This last phenomenon was the subject of another study by the same team, published in May 2016 in Psychological Medicine (4th link below). This study showed that people may maintain a certain “cognitive fluidity” after using LSD, which suggests that it might be used therapeutically, in particular for depression and the mental rumination associated with it.